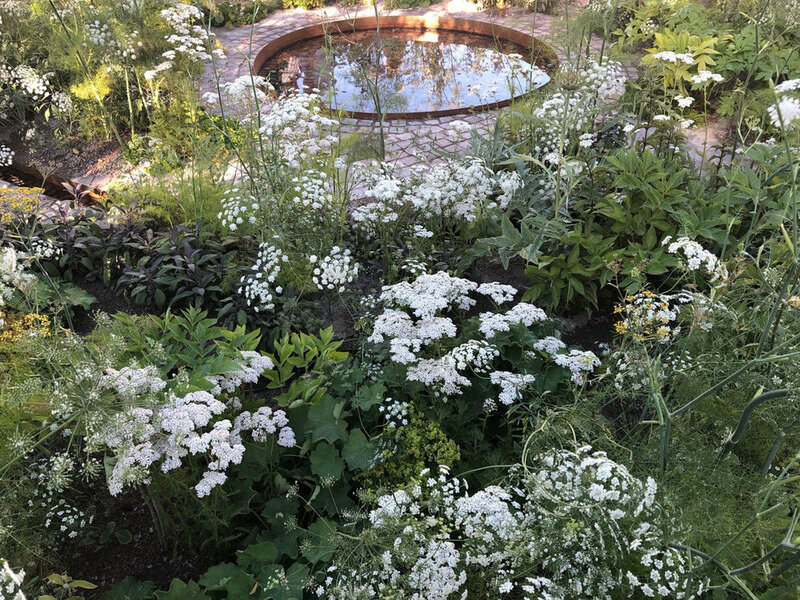 Invited by the RHS to design a garden towards the theme of Health and Wellbeing; Alexandra created a garden with a continuous path which looped round the space to encourage mindfulness and provide opportunity for walking meditation. A garden to encourage deep thinking via a continuous path with no start or end point. The visitor moves through the space without a destination – a space which is defined by motion rather than walls. The aim of the garden is to slow one’s pace, mind and encourage a sense of being in the moment. Visitors are encouraged to use the continuous path as an aid to walking meditation. Along the path one can appreciate the filigree forms of umbellifers and gossamer fennel leaves. Awareness of subtleties such as plant movement in a breeze and backlit petals is heightened. The layout of the garden is denominated by the path’s route which loops and circles to contain a circular water trough and round of thyme. This curved path is intersected at various points by a serpentine rill. Senses are heightened for example via sound of flowing water, cushioned feel of camomile atop the seat and the uplifting fragrance of mint varieties. The ultimate aim of the garden is to disengage anxious thought patterns, move the mind into a neutral space so fresh energy may flood the system; with internal balance restored and a new perspective instilled.